I am not a list maker. I have never liked lists. I had and have good reasons for that. Paper lists are clumsy when items are added over time as they can't be sorted without rewriting. Computer lists can be resorted, but in the past that wasn't much help: at some point that list always had to be printed and then it became clumsy again. There was also that I'd think of things to add to the list when I wasn't at my computer. Then there was the sharing aspect. Our grocery list is a great example: we both add things to it. Our computers could do that, but only if both were on. I stayed with keeping things in my head and my wife put Post-it stickies everywhere. Wunderlist changed that. It's on all our devices: computers, phones, tablets. We can share lists or keep them private. We can sort items or just drag them into the order we want. It's not perfect. We don't use the "completed items" feature at all. Instead, we treat most of our lists as masters and we click the "Priority" star for what we need to buy this week and unclick it when done. Sorting by Priority makes that easy. We still use our Amazon Echo lists because that's often more convenient. What would really be great would be if I could say "Alexa, add bananas to our Wunderlist Hannaford list" - or even better just "add bananas to Hannaford" and have it know to find that list at Wunderlist. 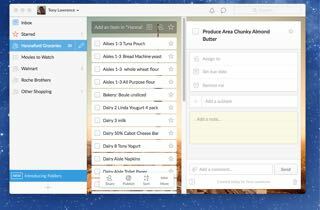 I've suggested that to both Amazon and Wunderlist; maybe it will happen someday. Echo has recently added support for IFTT; if Wunderlist did the same we'd have at least part of this now.